Speaking activities should be the core of the communicative approach. However, there are many textbooks that come with very few exercises to practise this skill. And then you have to create your own. To save your time and energy I will share four speaking activities that worked very well in my classes. The first activity is called Draw the Picture and I was really surprised how well it worked. 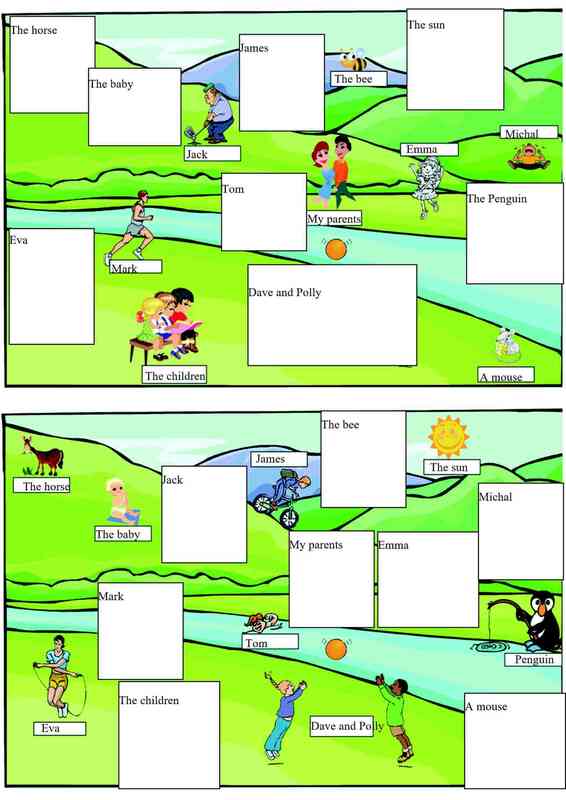 I have used the picture before to teach the present continuous tense. But this time I covered some pictures with a white square and I put only the name of the person there. Parts of the worksheet are covered with white squares. Seat the students in pairs and give one of them the worksheet A and the worksheet B to the other one. Students should ask about the people in the white squares and draw them into the picture. Students take turns and they try to finish the picture. This leads to a lot of speaking and communicating. Print the following worksheet. The family tree with the words for the relatives should be printed on one side and the page without the words on the other. Ask the students to complete the worksheet for their families. Help them if necessary. If the students do not have the relatives, they should make the names up. Then students work in pairs and one of the students dictates the names to the other one. It is a great opportunity to practise spelling. Once they finish, they swap roles. Having finished, students turn the worksheet and try to complete the family tree for their family again. Once they have completed it, they dictate the names and their relationship to their partner. In this way students practise the family relationships perfectly. EFL Speaking Activities – Where is my Sock? Honestly, I am not very good at teaching very young learners. I cannot sing, I cannot dance and I cannot organise the games very well. That is why I hardly ever share any activities I create for the youngest. However, sometimes a miracle happens and I create an activity that works very well and my students like it. And exactly this occurred last week. The activity is called Where is my Sock. After learning the rhyme Where is my Sock? from the textbook Happy House 2 (unit 5) I handed out the following picture to everyone. Then students worked in pairs and one of them got the pictures of a sock, a bag and a shoe. “Is it in the bathroom?” etc. Once the pupil found the objects, they swapped roles. Students enjoyed the game and they practised the questions and the names of the rooms. Sometimes easy does it. This is one of the oldest and most used activities ever. The aim here is to practise the usage of the personal questions. Print the following worksheet. Each student needs one. Ask the students to make up the personal details. Just ask them to include @ and dot in the email and keep the telephone number reasonably long (nine digits in the Czech Republic). Then elicit the questions and write them on the board if you are not sure that the students know them. Put the students in pairs and ask them to ask the questions and complete the second column. Delete the questions you are sure your students know well and put them into different pairs. Students ask the questions again and complete the third column. This activity works very well in a class in which students know each other fairly well. I am afraid, I cannot make any mobile apps. Sorry. However, many of the games work on mobiles.